TAMRACOUNDA – Top view Guinea is an emerald set in the desert. For the crews of the 11th Paris Dakar, though, is a green hell, furrowed from the red laterite trails are treacherous roads, fast but slippery. 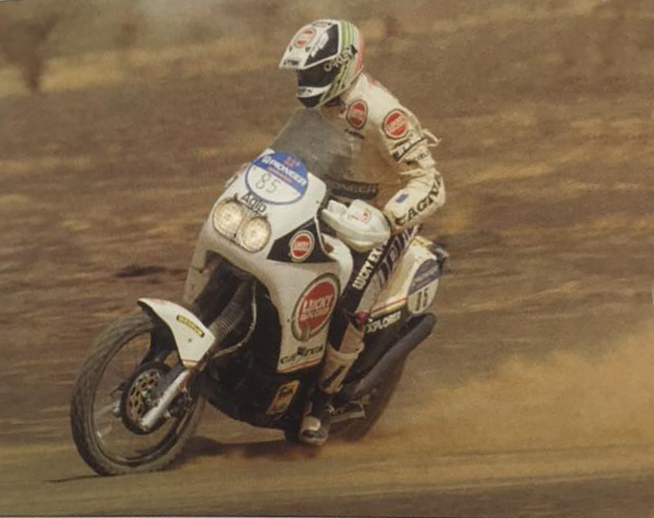 On his third impact with the jungle the most grueling rally the world has rediscovered that isn't just the Ténéré to suffer. Guinea if will remember long Clay Regazzoni, Claudio Terruzzi, but Spanish too Prieto, and the two good Samaritans from team Assomoto Giuseppe Cannella and David Parks. Were the latter, in fact to pull away from his Mercedes partially destroyed by a lump of Clay didn't take penalty rollover. We were about a kilometre 270 of the Special – tell these two guys in their thirties, of Brescia – When on a fast track to hump hump, We saw a wheeled machine for air. It was in a pool of gasoline and Navigator who was already out, He was bleeding from his arm. We recognize him: It was Dane, Clay was still inside and was trying to get rid. 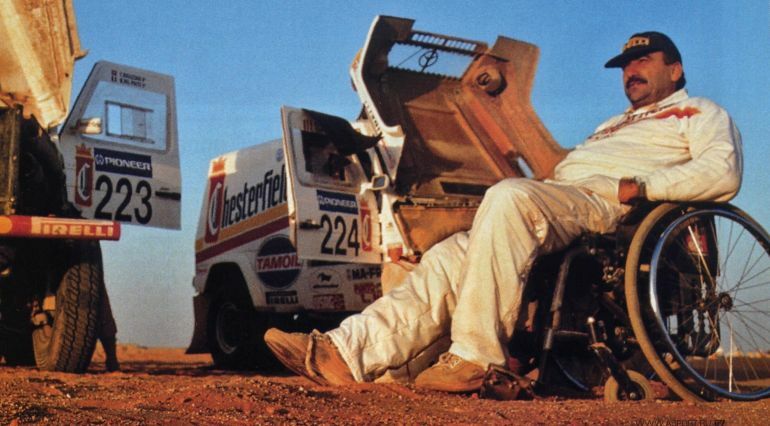 Careless that time flowed, Joseph and David they accommodated Regazzoni outside of the machine, leaning on a Boulder because his wheelchair was destroyed, medicated and Dane. No one stopped to help us out – remember the two – one threw us bottled water out the window. Past people who had no problem of ranking… We do not understand, When everyone feels special samples. 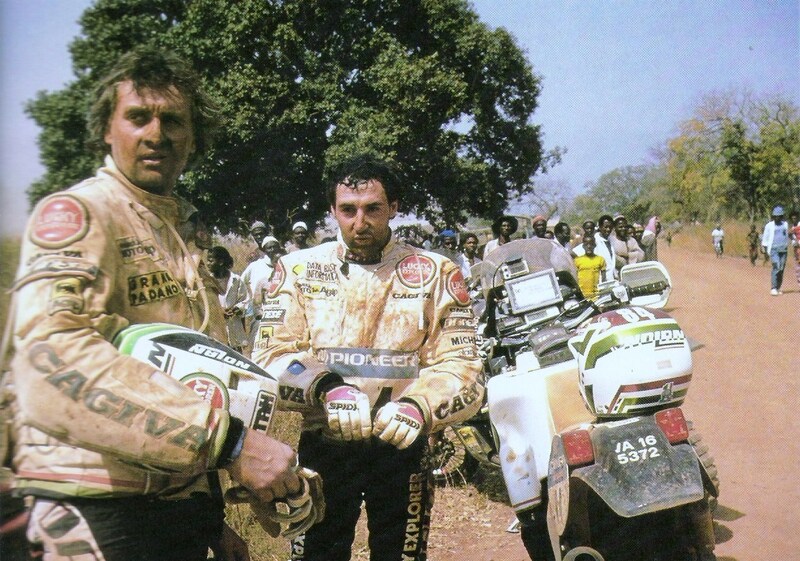 It stopped, Instead, Claudio Terruzzi and Klaus Seppi. 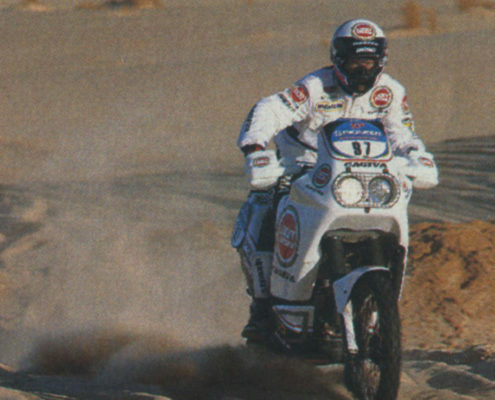 A history of Dakar, a snippet that, along with other, Rebuilds one of the toughest days of the rally. 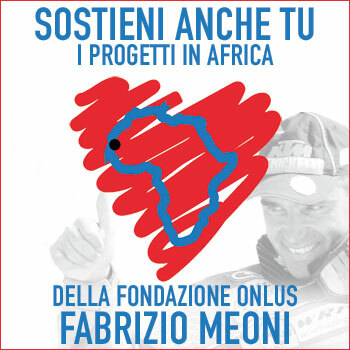 É was a special inhuman – says bluntly Terruzzi, got to camp at night – before meeting Regazzoni I had seen all the colors. 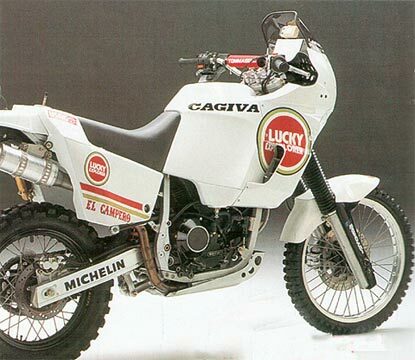 I ended up in a Ford at km 130 I was walking because my Cagiva went to a cylinder. Suddenly, While I was with the water for life. the engine is ' taken ' and slid to the bottom slippery. It took me an hour to draw out the bike from Ford, Thanks to the help of some guys who came from a nearby village, and with them I started to disassemble the bike to try to make it restart. There are finally managed, but a flashback set fire to makeshift air filter and one of my helpers, afraid, threw a handful of Earth in Carburetors… Luckily while I was busy to disassemble everything again and got Sad, my assistance, with the car, that pulled me out. I was sad when he left behind say all these kids who had been busy to help me, but I more think when, in the dark I found myself having to do the track behind the car. In a fuss that limited visibility to a few meters Terruzzi fell, hit a cow, and rebooted again pulling blindly, but he couldn't avoid the penalty. And say – Remember – that was a great start… before me I only had two tracks. I must have been third before falling into the damn Ford… the road book was done by dogs, for a coat I have risked my dry skin in left turn, which then tumbled Magnaldi. Sabri, that helped him in the evening with him at camp. 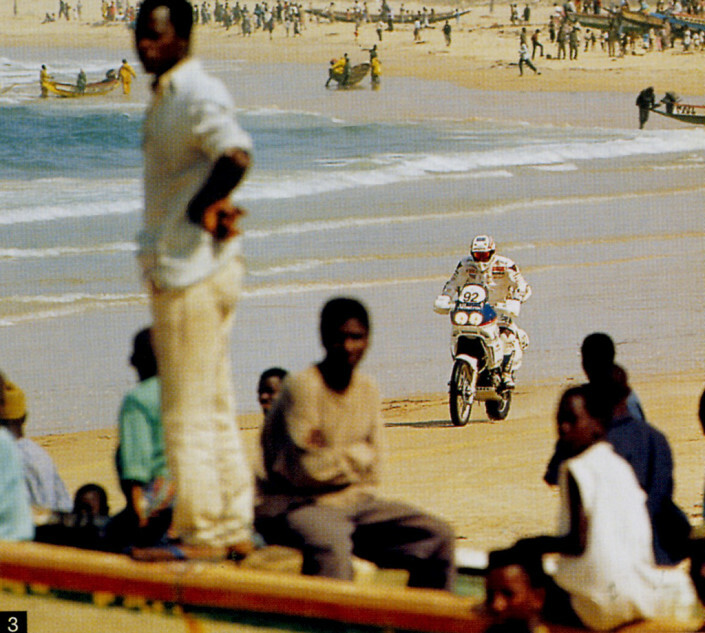 Another piece fits into the puzzle of special Bamako – Labè. 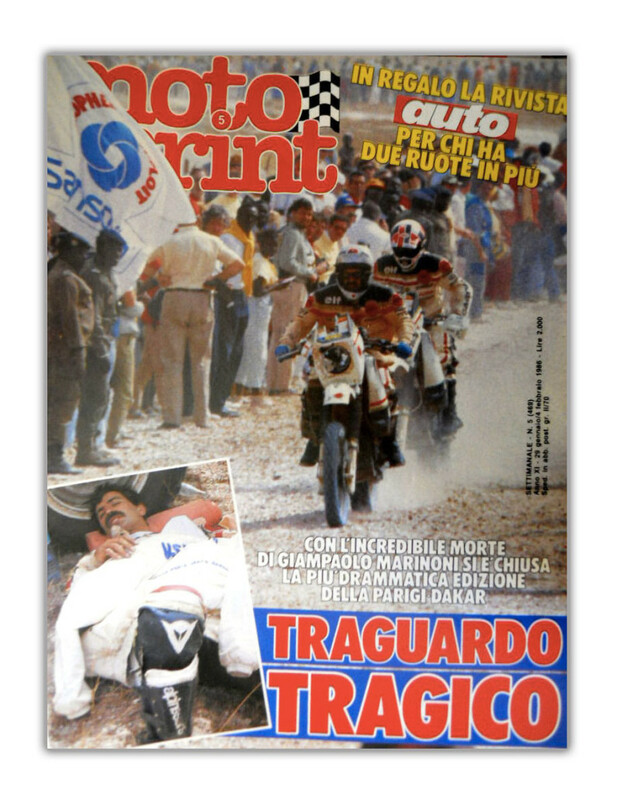 We all had a deep Ford, us machines – fast assistance tells Cagiva – theno water there was the Nissan with Prieto. He couldn't go out. He was driving, While his second had dived to fix the slides under the wheels. Came and went, in that muddy water, when suddenly I heard him shout. Li per li didn't understand, then I saw him hold Prieto, that was in the water unconscious, for underarms. The muffler sfiatava inside the body and he, breathing carbon monoxide, He had fallen asleep, slumping driving. He had barely had the strength to open the door before you go wild in the water. Fortunately that, in all the confusion the Navigator if you noticed. 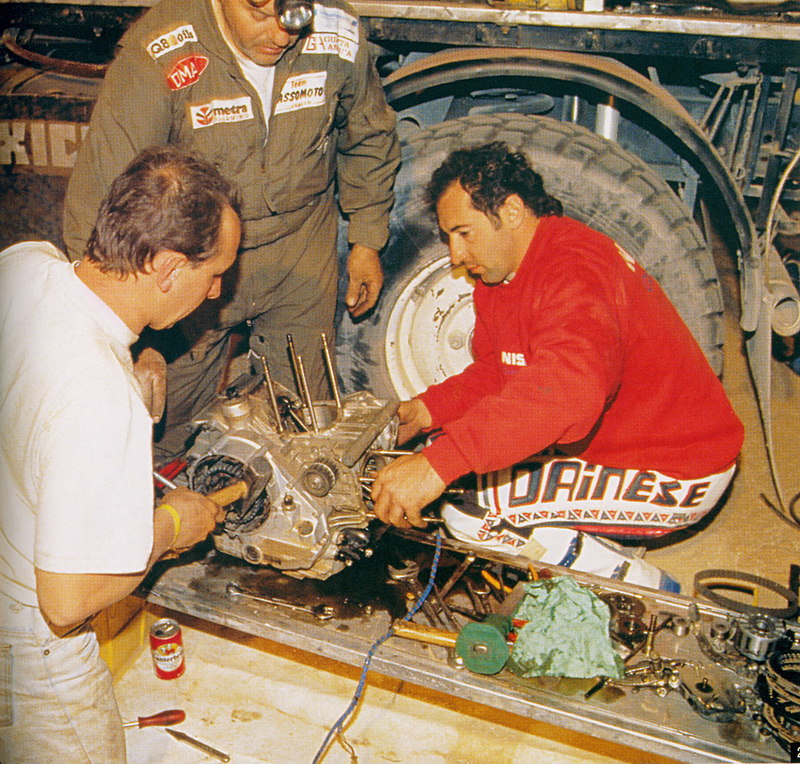 It's the day after tomorrow when, with a machine of doctors, get Regazzoni at the bivouac. Dirty, unshaven, is almost unrecognizable, but not tired, nor unpacked. 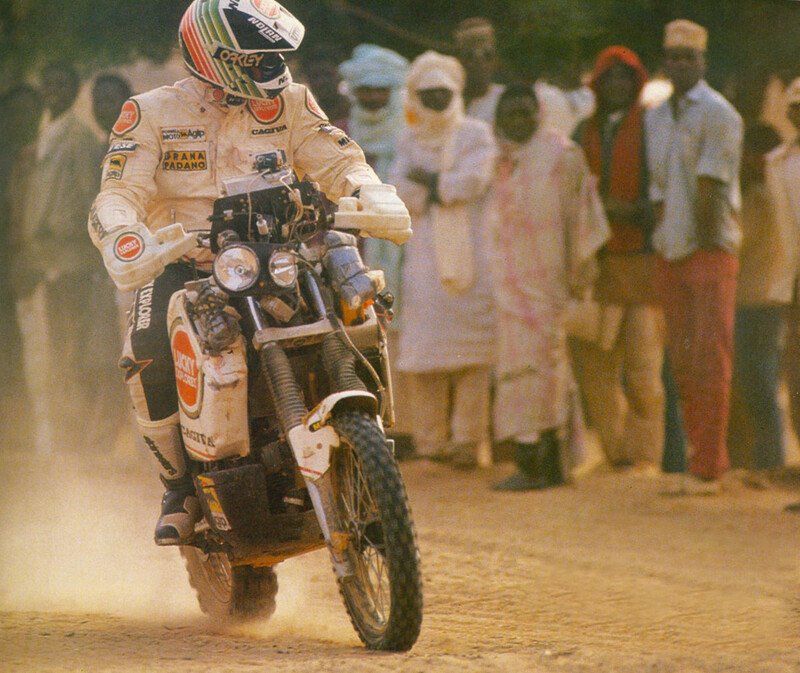 The longest day of the Dakar will close in his story. I can't figure out – He says shaking his head – We were fresh off the hardest part of special when in a straight Red Earth, the car got sideways. I checked for a while, but then I shot off. It stopped after four spins with the wheels in the air. Smelt of petrol and a priest moan. 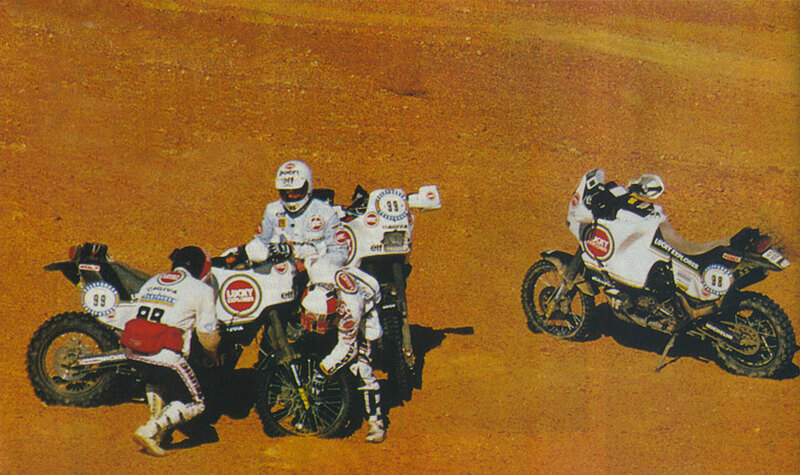 Then came the two Italian riders who helped me to get out. While people continue to leave the special Clay speaks. Are the trucks that didn't made it in the night. Let's review the bivouac dark, devoid of light generators, and those few trucks arrived as a foothold for all. The special Bamako – Labè lasted exactly 24 hours. Nobody saw it coming so hard. 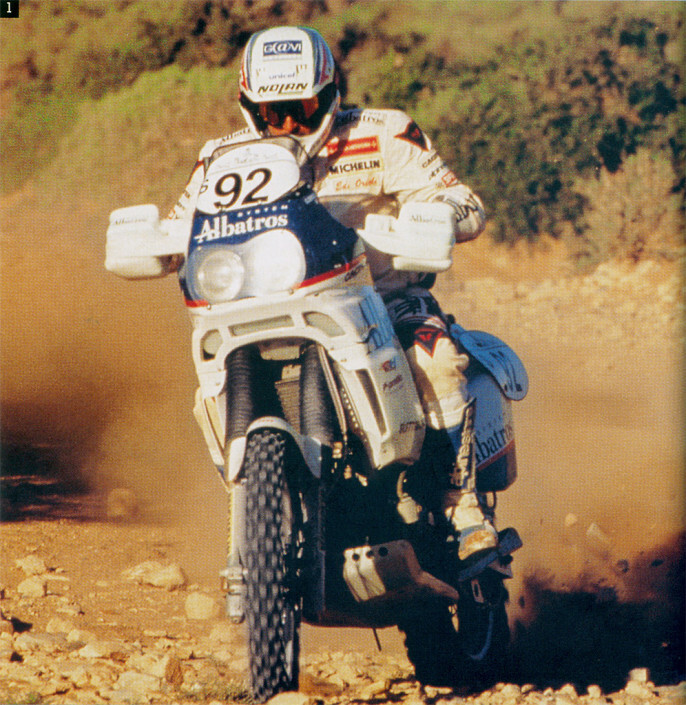 Do you have a minute to tell us your Dakar? I started as a fast assistance, I like Picard, our protected were Bacou and Dalia, to them it was the honor of carrying on of the Cagiva; at one point Dalia had his accident, Bacou instead was below expectations and so I get out of the blue the better placed. I had accumulated much delay to fulfill my duty in the days before, and at that point even if I had the spirit of jumping to mo’ Kamikaze I couldn't conclude that great, so I did my race to get to the end without damage, even psychologically wasn't prepared to become man winning, and overall sixth place I filled me. Did you find this edition really harder than in previous? Last year I experienced very little of Dakar, definitely in my opinion the first stages of this year have been far more challenging than last year. From the Middle onwards I would say that the difficulty of the routes not seemed so incredible, some kilometres to-run daily were not few, but in my view it was not a ruthless contest. How would you like in the future? 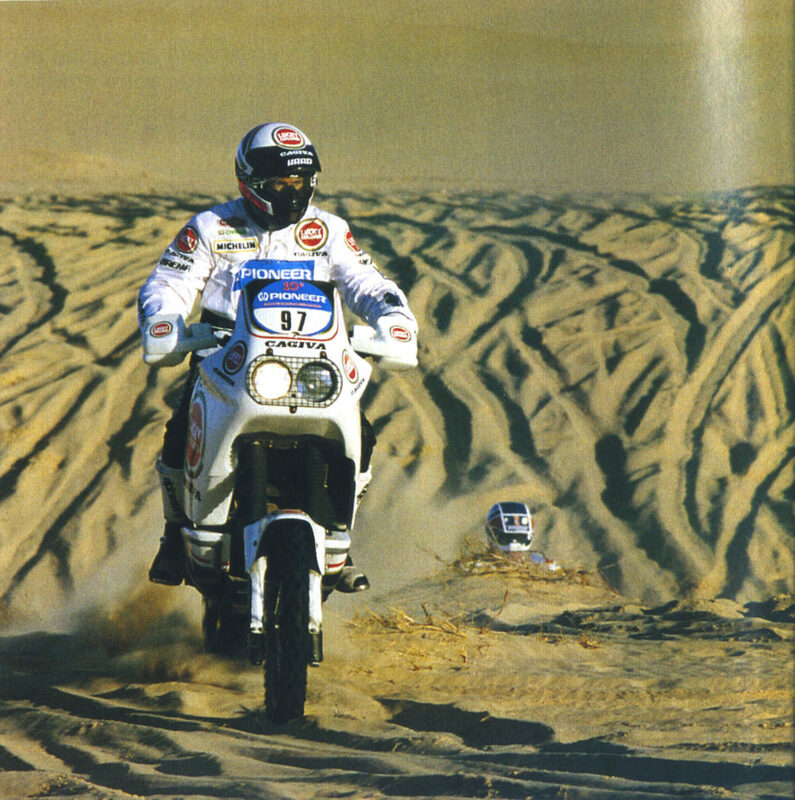 Medical care is definitely the thing that should be better maintained and improved, otherwise the Paris-Dakar rally seems to be so; is the mileage, the hardness of the routes were to my liking, the rest should make it easier would lose much of the charm that has for all of us. 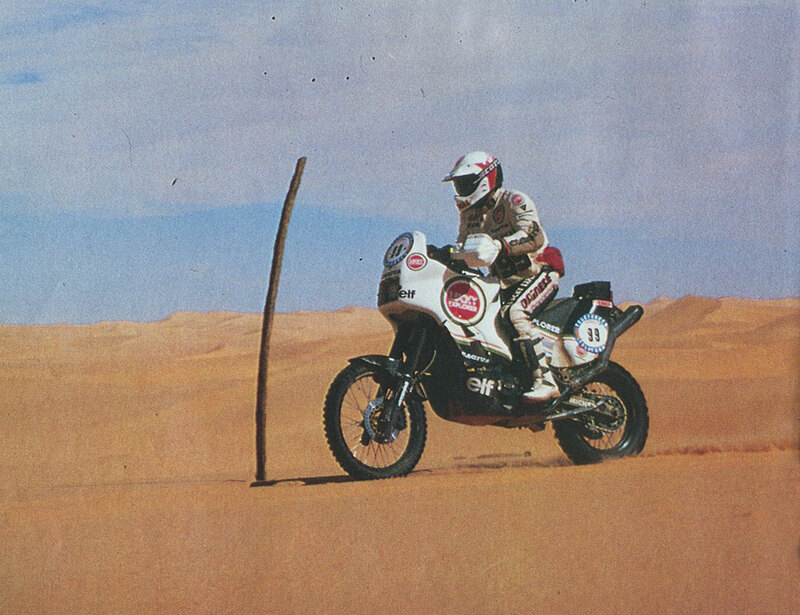 If it were up to me I would limit assistance regulations, now is allowed to all, cam-change every piece of the bike or the machines is a habit every night, However in my view limiting substitutions in Dakar would arrive over the pilots better even more hardship motorbikes, of course such a regulation would turn up their noses at Homes, but that is my personal idea. 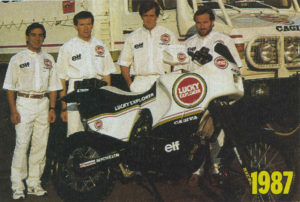 Your bike was perfect or what avretri wanted more or less? How many times did you fall and for what causes? 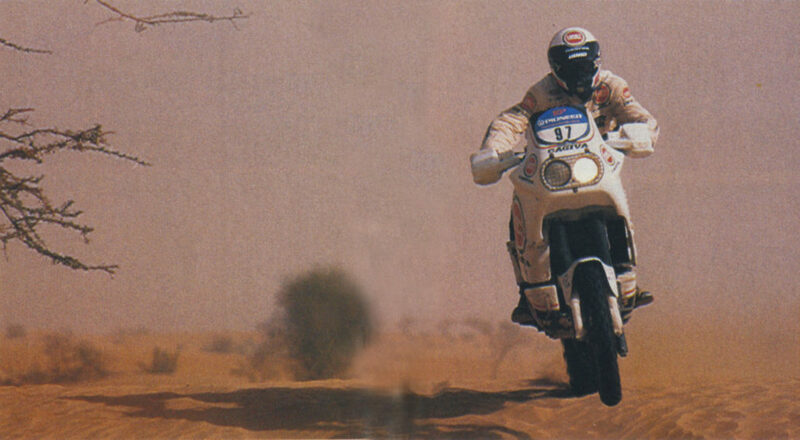 Do you think the African rally is more dangerous than other races? Tell us about the most curious of your Dakar. Towards the middle of the race I was in a group with Orioli, Terruzzi and Fatemian and did a dirty gasoline supply, pretty much everyone we were in need of repair, but the only bike that was able to digest that petroleum was my surrogate Cagiva so I helped Edy pulling and pushing until his bike is broken down. 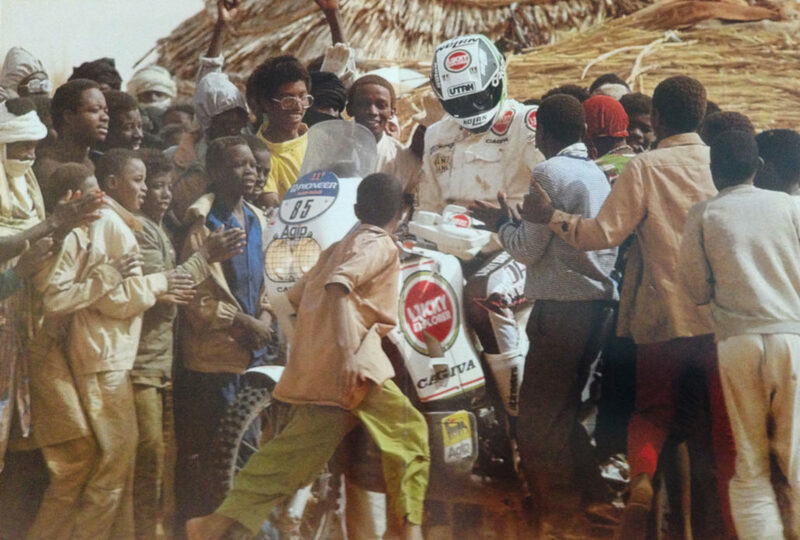 In spite of the Paris-Dakar was the most exciting race of my life, I think its not to participate more, to me it came “Mal d'africa”, for this I think I won't come back. To win you have to risk, I realized that while not risking not I accused no dropped, and then if I get resubmit probably would try to cancel the gap with the best and to do that I should risk more than you want. 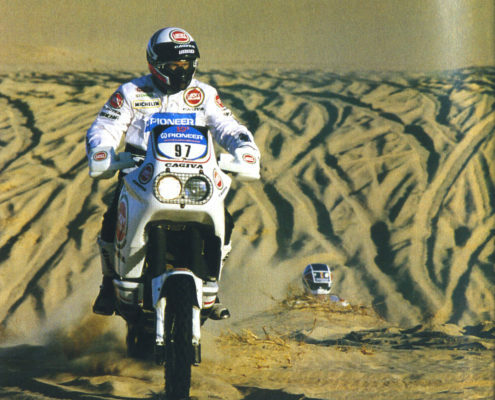 The wealthiest enthusiasts, celebrated the birth of the regulation Marathon for Paris-Dakar 1994, that would make it to the use of means of direct derivation by means of series (choice who slew the expensive official prototypes). 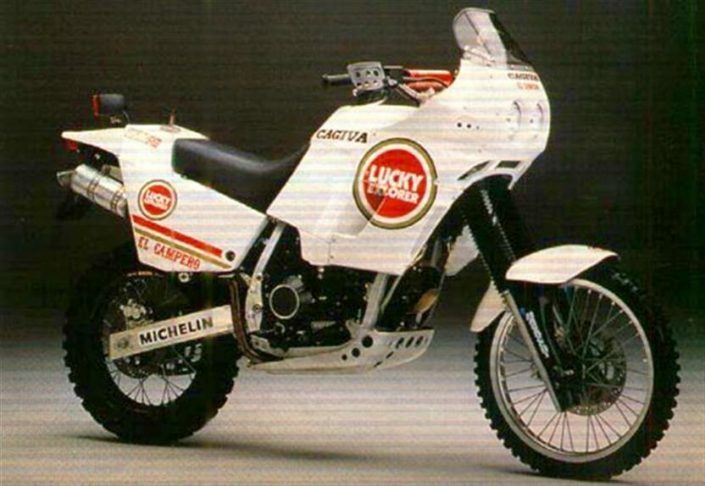 Cagiva set up then the 944 Marathon, that was the basis for the motorcycle driven by CH Racing team Roberto Azzalin and that went on sundries varesina the second Dakar with Edi Orioli. 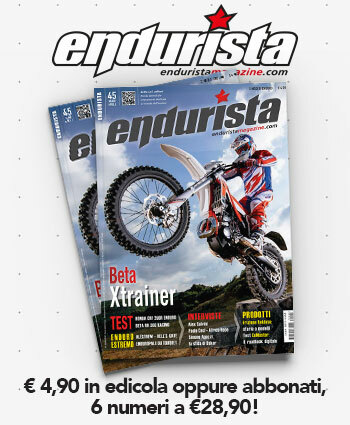 The Marathon regained several fine details of the previous 900 IE but went even further: Apart from just the return of coupled Marzocchi Magnum – Ohlins, on this special version was adopted a front rim from 21 ", best suited for use in off road (comprehensive measures 90x90x21″ and 140x90x18″) but especially the unprecedented (series production) engine 944 CC powered by refined Carburetors Keihin FCR flat valve capable of delivering 75 horses and 7, 25kgm. 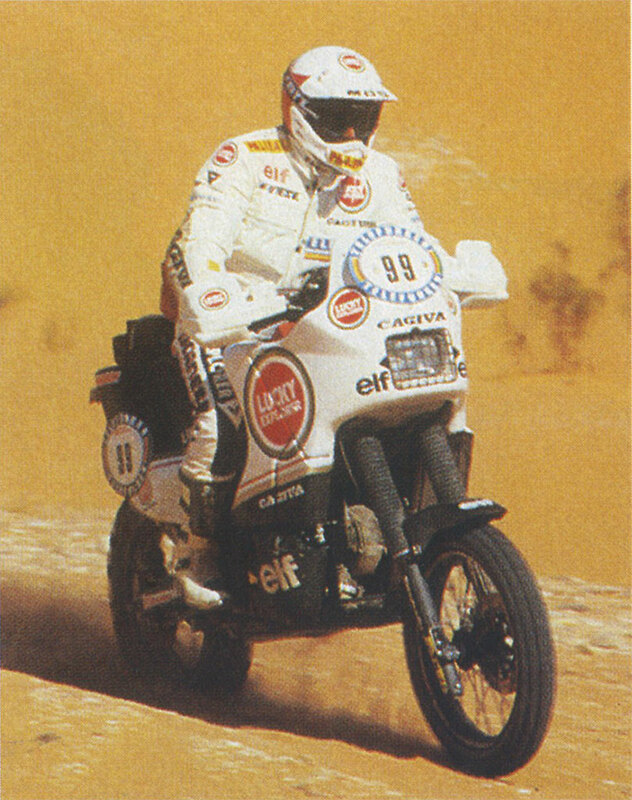 The Cagiva Elefant of Edi Orioli – unofficial the pre departure Lacchiarella, on the occasion of the Dakar 1992. 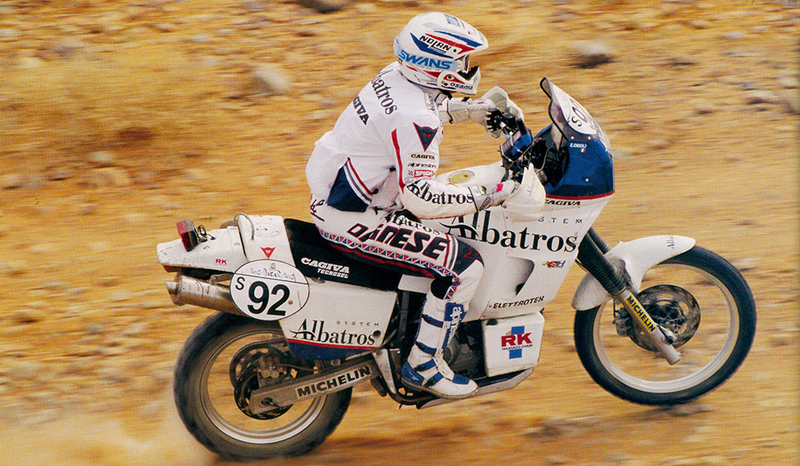 Big changes to Dakar 1994. 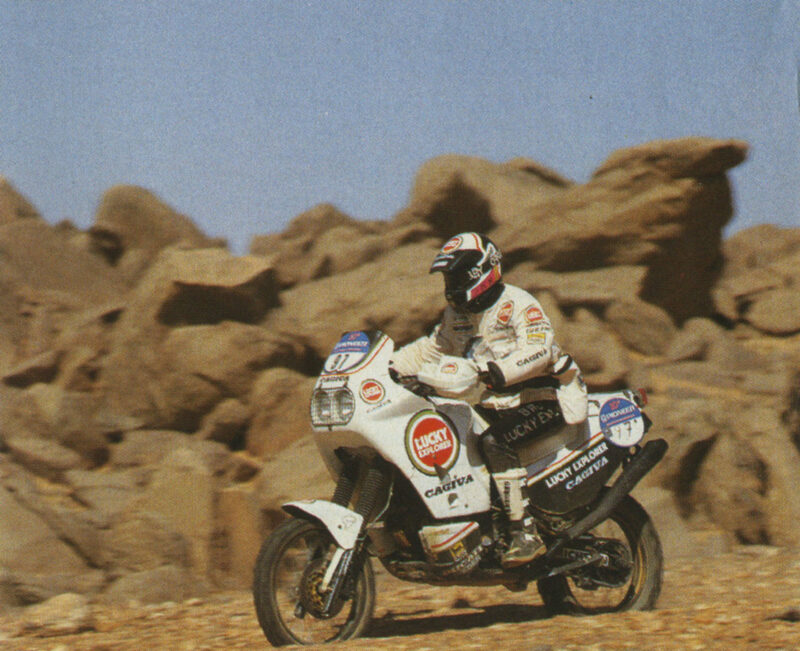 The ride passed into the hands of the ASO Group, changing the rules, penalizing the “formula one” of the desert. 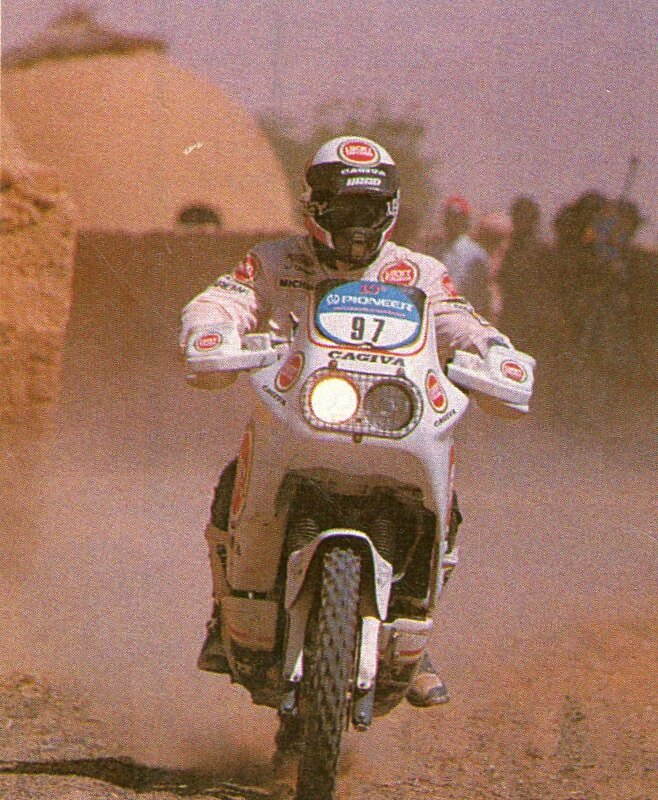 We left from Paris and, After a turning point in Dakar, the 16th Edition ended again in Paris. The Yamaha, contrary to the change in regulation, He resigned in protest. 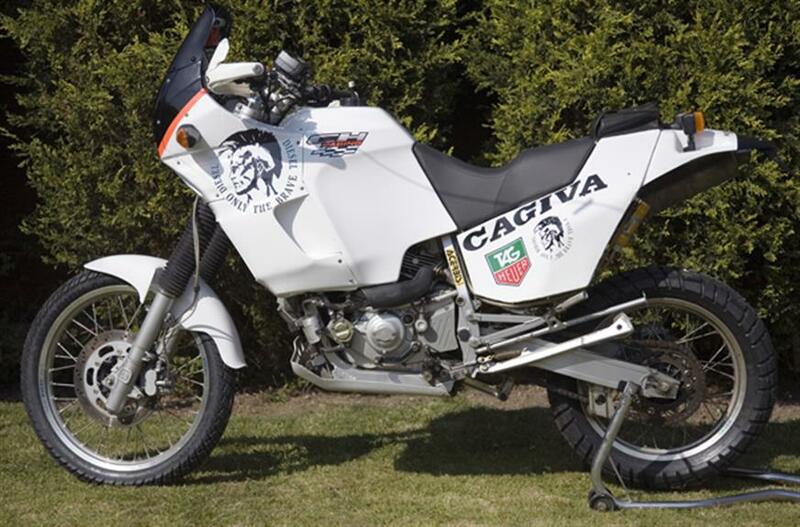 Orioli came running with a Cagiva, still prepared by Azzalin, a version “mortified” derived from production motorcycle went into production in the meantime. 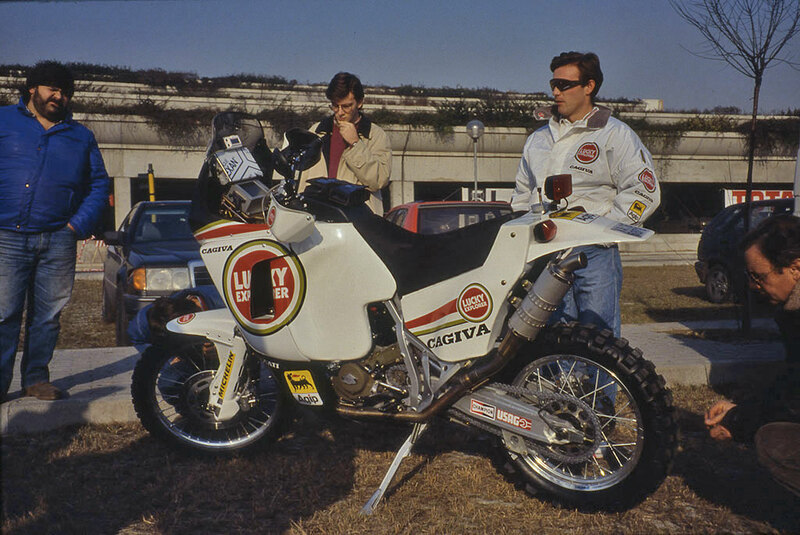 The Dakar that year was at least “discontinuous” due to a series of organizational problems that led to the cancellation of some stages. 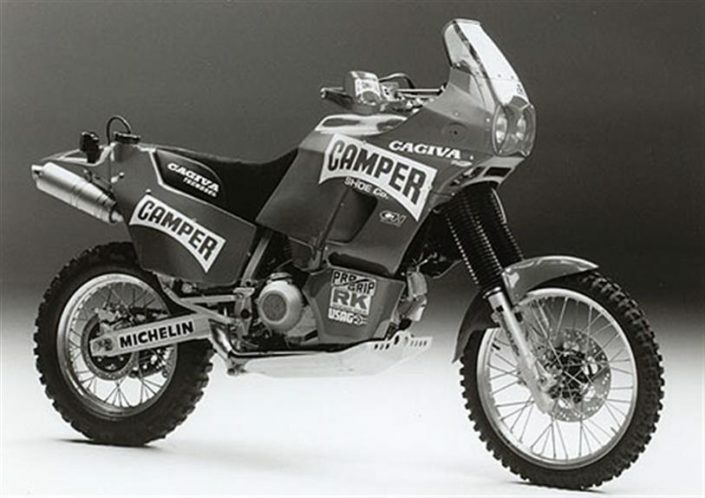 KTM, which presented for the first time an official team organized around its ACE Heinz Kinigadner, He won the first stages enduristiche, then it was a triumphal March of Cagiva. The strip contains, MAS, Gallardo, but especially Orioli. 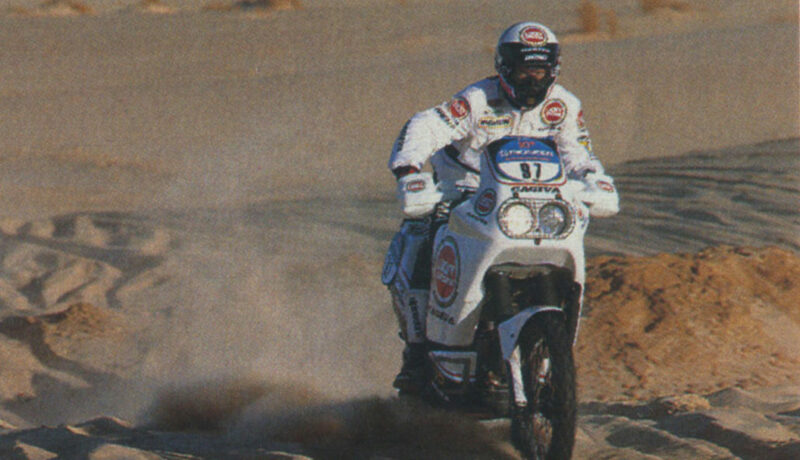 The Dakar 1994 focused with a riveting duel between Friulian and Jordi strip contains, just a few months away from that, victorious, of the Pharaohs. 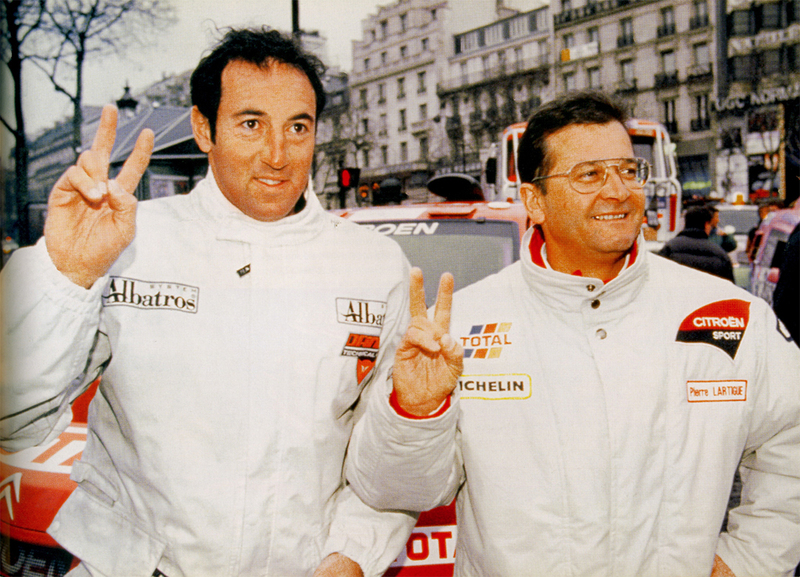 Yet in Bordeaux Orioli had to already change its engine, and in the night gives Boutilimit, halfway through the stage “Marathon” that would have ended at Atar, was with sixth gear that wouldn't fit more: everything seemed to have put back in play. 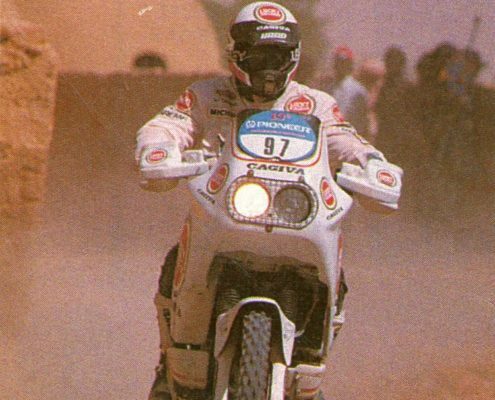 The regulation prevented a second change of engine, and it is here that entered the scene Pattono and Minelli, two mechanics Cagiva from great qualities and great-hearted. The mechanics will make a difference, all night they alighted a motor (the retired Goffoy) and then another (to Orioli), to perform the transplant Exchange gear. 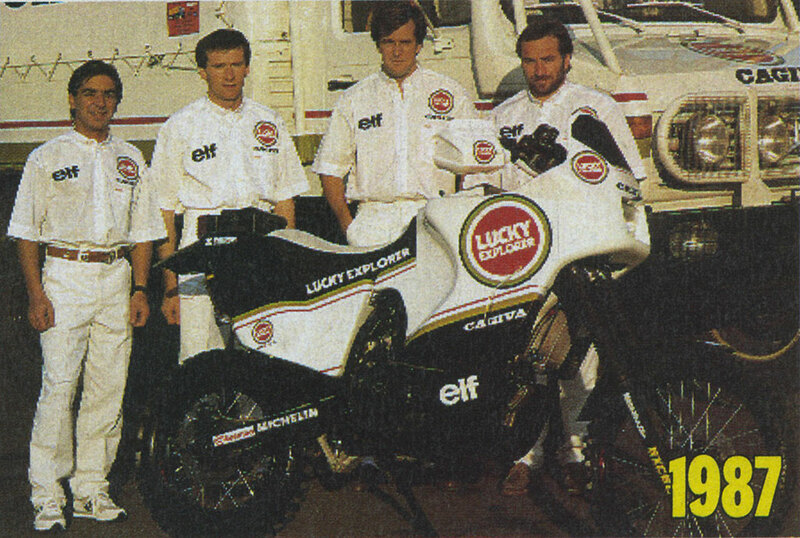 A night spent in white, where you worked hard and without interruption, but it was worth the effort, the bike was ready for the next morning. Orioli would do the rest, outclassing poor strip contains, that on that occasion went down in history as holder of second place with less detachment, Orioli joined like a King, triumphantly on the Champs Elysées. 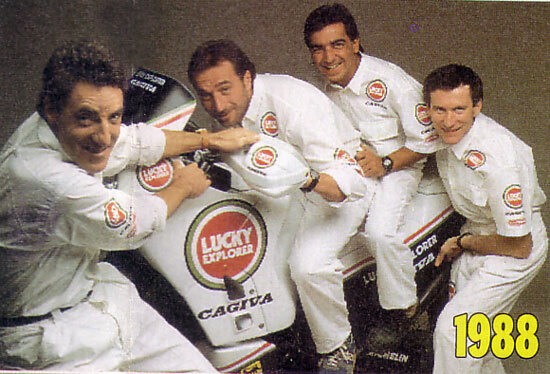 Despite not being the victory in the absolute, that of 1992 represents an excellent performance of the squadron Cagiva, that second place American Danny Laporte, in third place Jordi strip contains, Marc Morales at 4°, EDI Orioli to 7th and 10th place Controls to!